Although the Indian space establishment rules out a space race, MOM is certainly at a tangent from the standard Indian portfolio of space probes that are application-based. “Yes, this is a test of our technological prowess and endurance,” says Dipankar Banerji, associate professor at Indian Institute of Astrophysics in Bangalore. It is accompanied by a shorter one containing photos of three of the instruments on test benches: the Mars colour camera, the methane sensor, and the lyman alpha photometer. 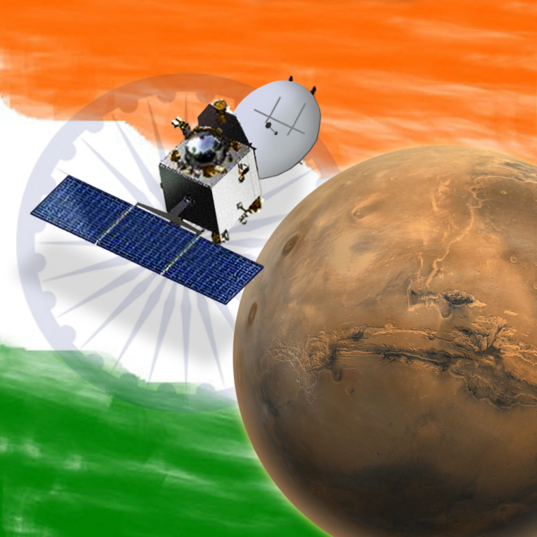 That article also has the following to say about the name of the Mars Orbiter Mission: "After Chandrayaan, the natural name for the Mars mission was Mangalyaan. That is how it was referred to in the media, too. ISRO, however, is touchy about this. 'It was always called the Mars Orbiter Mission. All government fund sanction has been to the project under this name,' said a statement released by ISRO." Superstition among space scientists and astronauts is rampant. While in NASA, scientists popped lucky peanuts while tracking crucial moments in the journey of their Mars probe, Curiosity, the Russians have fine-tuned an elaborate system of ceremonies for every launch. Before a launch, the mission's project director rubs the space vehicle with a lucky coin. Cosmonauts plant a tree in the cosmonaut gallery at Baikonur. Midway towards the launch, they get off the bus that is taking them and urinate on the tyre. At Byalalu, the smart data collection, retrieval and processing centre has a series of safety mechanisms and back up systems to keep data safe. Every machine in this room is daubed with a tilak of kumkum and turmeric. "It's harmless. And the great outside is so unexplored, it doesn't do any damage to propitiate the gods, does it?" asks a scientist. In the end, the three instruments will essentially be part of a orbiting 'spacecraft' that will weigh less than 100 kgs. Not to mention how they are planning to first put the craft in Earth orbit using the PSLV and then slowly elongate the orbit so that it eventually escapes Earth orbit. Sounds kind of like a typical Indian 'jugaad' to me. I would know as I am an Indian. LOL. Hi Sachi -- 'jugaad' - I don't know what that means but if that's what they have to do to leave orbit, so be it. As long as it works!! Right?! Sachi Mohanty is a typical Indian who looks down at the potential of the present day "Smart-Swift" crop of Indians. It was ISRO which gave a free ride to 6-payloads from NASA, ESA, JAXA out of the 11-they carried. The "jugaad" attitude has only taught the them to make sure they always look upwards; unlike what some people today look downwards at their own fellow country men. Correction: The free ride of 6-payloads was offered in the Indian Lunar mission, Chandrayaan-I. "Jugaad" : stands for 'arrangement'; meaning one can get solution to every problem by 'arrangement'. S.M -- Hi. Thanks fr the definition. It sounds like maybe the U.S. equivalent is a trade off or a business favor. Hi Bob... You have been quite active on many blogs. Jugaad means; for every problem there is a "solution"; this mean of finding a versatile solution is "jugaad"
Thanks S. M. I hope to see you around on other blogs. Good Indeed, a dream come true. @bob... 'Jugaad' would mean an indirect way of fixing things when the obvious option is not at hand. Some thing like using chewing-gum in place of glue to temporarily fix a thing. As for the ISRO context, I wouldn't say it is a 'jugaad'. Use of eliptical orbit to gain smooth entry in to another orbit, although time consuming, can guarantee better success. I think we should he proud of ISRO for being a successful Government organisation.